It seems as though I have been working on Moorsview 2017 for ever, so it was great to finally get one of the planned events underway at the Joe Cornish Gallery last weekend. This first exhibition is the curtain raiser for the main seminar and includes work by all the speakers: Joe Cornish, Peter Leeming, Lucy Saggers, Robert Fuller, Steve Race, Karl Holtby, and myself. I knew from the range of photographers included that the exhibition would be varied in style and content, but seeing the work hung together in print form really brought this home. When people think of the North York Moors they tend to get a vision of a high, but empty landscape characterised by a monoculture of heather. But looking at this collection of work shows that the region offers so much more than that to the outdoor photographer. From the colourful coastal rock panorama from Peter Leeming, to Karl Holtby’s moody black and white of Port Mulgrave. From the action of Steve Race’s Northern Gannets fighting for fish to the delicate seasonal portraits of weasels by Robert Fuller. From Joe Cornish’s softly lit Roseberry Winter Twilight, to my own vivid image of burned heather in blue winter light. These contrasts illustrate the huge range of landscape and wildlife photography possibilities offered by the North York Moors and Coast throughout the seasons. Here are a few images from the exhibition launch, and an example from each of the exhibitors. The exhibition runs until the 5th September, when it moves to ‘The Wonky Pitcher Cellar’, in Pickering for the weekend of the Moorsview Seminar itself. It then takes a break before opening again at the Moors Centre Danby’s ‘Inspired by..Gallery’ from 19th October. This last exhibition will also feature work by many of the speakers from the first Moorsview Seminar in 2015. Book your ticket for the Moorsview 2017 Seminar now by following this link. 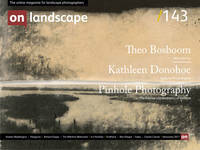 There is a £10 discount for all subscribers to On Landscape. A blanket of snow simplifies the landscape and hi lights the familiar form of Roseberry Topping, whilst the sky is gently blushed with pink by the fading light. A shot made in the fog of a January afternoon on Spaunton Moor, as the weak winter sun faded to dusk. Conventional distant views were impossibly obscured. But my eye was drawn to the russet remains of star moss, and the way it contrasted with the blue winter light reflected by standing water, coupled with the graphic tracery created by charred stems of heather burned in the previous year. When he spotted a wild weasel in his garden Robert seized the opportunity to watch this little-observed lithe mammal up close. Whilst weasels are common, they are so small, fast and elusive that there are barely any studies of their behaviour. He left food out in specially designed boxes for the minute female predator. Once he had got her 'trained' as a reliable visitor, he developed his back garden as a sort of 'weasel town'. He put 12 surveillance cameras at strategic points in the garden, alarmed motion sensors, a nesting chamber where she went on to raise her kits, drystone walls, log piles, root piles, clambering branches and even a mini-pond. These were linked to TV screens in Robert’s house so that he could track her every move; following her story from the moment she was mated to the birth of her kits. It was a real privilege to get an insight into the secret world of a family of weasels. These photographs tell the story of this tiny family through the seasons. Gannets travel great distances to catch fish. This image shows two gannets fighting over their catch on one of our Yorkshire Coast Nature “Diving Gannet Photography Trips”. The image was taken from on board our boat underneath Bempton Cliffs, East Yorkshire the only mainland seabird colony in England with over 412,000 breeding seabirds which includes 26,000 Gannets. I hadn't visited Port Mulgrave until 2015, I'd been made aware of the fisherman's huts here and they sounded as if they would be a fantastic photo opportunity. I wasn't quite prepared for the atmosphere of this place, maybe it was me but Port Mulgrave has a brooding air and strange yet fascinating energy about it. I've since visited many times, this energy and sense of desolation drawing me back for moody images such as this, which was taken on a particularly grey and tumultuous day.